Recently I was approached by one of my clients to help them to investigate a weird Sparklyr issue. 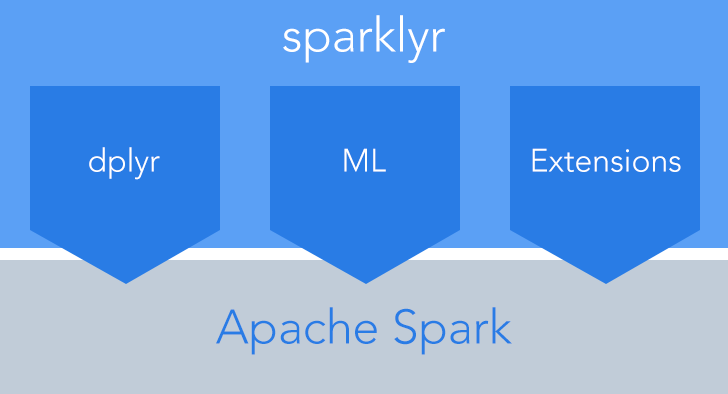 sparklyr is an interface between R and Spark introduced by RStudio about a years ago. The following is the the sparklyr architecture. Failed while connecting to sparklyr to port (8880) for sessionid (3859): Gateway in port (8880) did not respond. Here is the detail message. Did some research and found many people having the similar issue. Ok, try their recommendations one by one as follows. 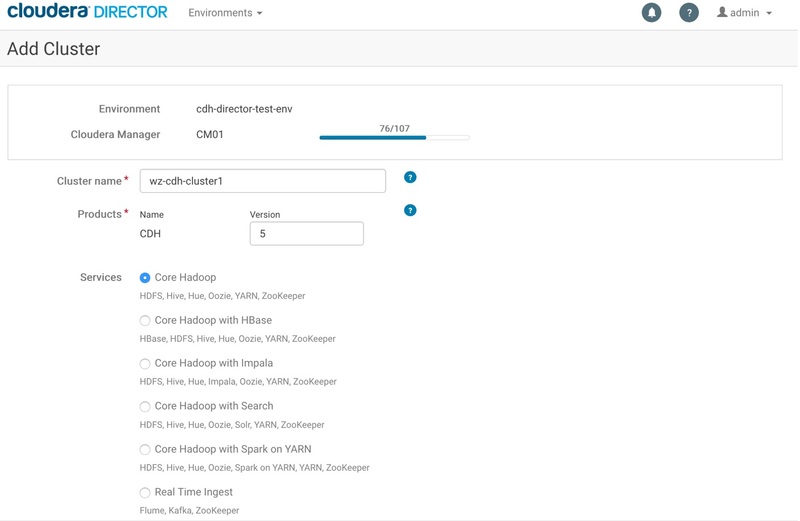 Try run Sys.setEnv(SPARK_HOME = “/opt/cloudera/parcels/CDH/lib/spark/”). No, not working. My client installed sparklyr less than one month ago. I don’t see why this option makes sense. Don’t even pursue this path. The R on the same server uses the same version of Java without any issue. I don’t see why Java installation become a major concern here. Ignore this one. Someone said just Spark installation is not enough, not to have Hadoop Installation as well. Clearly it does not fit our situation. 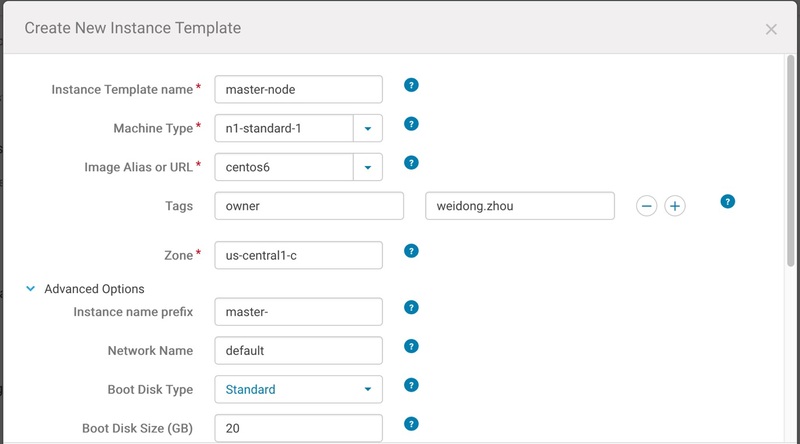 The server is an edge node and has hadoop installation. Running system2(‘klist’) does show no kerberos ticket. Ok, I then open up a shell within RStudio Server by clicking tools -> shell, then issuing the kinit command. Rerun system2(‘klist’) shows I have a valid kerberos ticket. Try again. still not working. Note: even it is not working, this step is necessary for further action when the issue is fixed. So still need to run this one no matter what the result is. 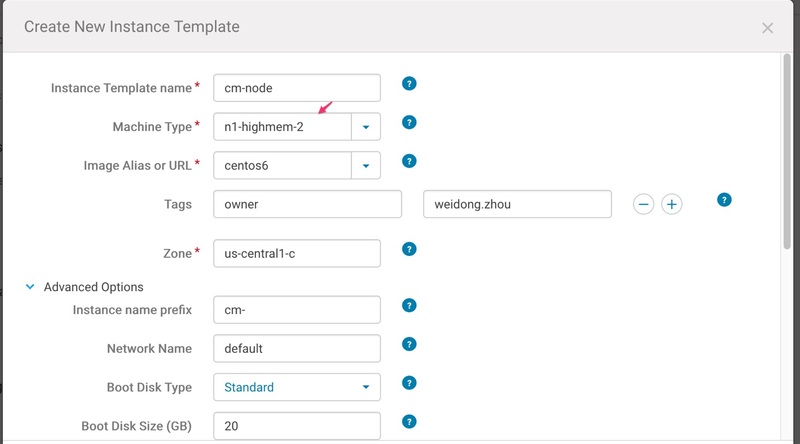 Someone recommended to create a new configure and pass it in. It looks like a good idea. Unfortunately, just doesn’t work. Although this approach looks promising, still not working. 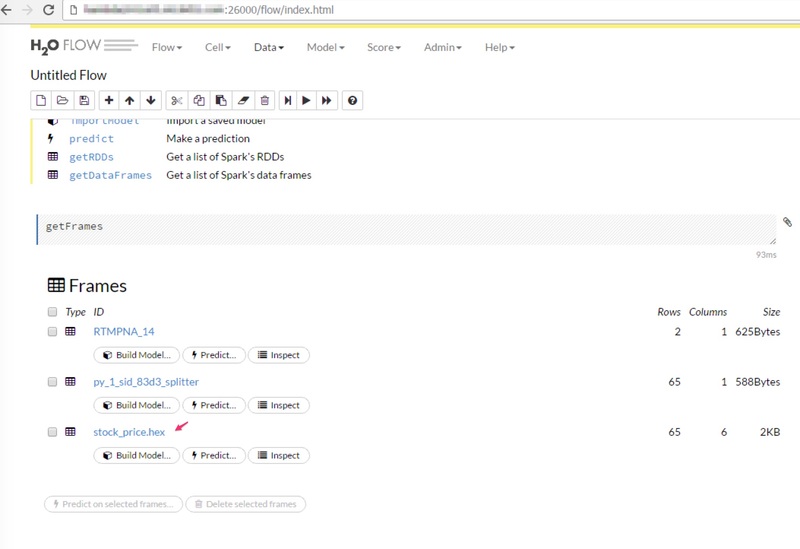 But this approach is definitely a way to use for other purpose to better control the Spark resource usage. Someone mentioned to set remote address. I thought this could another potential option as I resolved issues in Spark related to local IP issue in the past. So I add the following code in the configuration from the previous example, note parameter sparklyr.gateway.address is the hostname of active Resource Manager. Not working for this case. This is probably the most unrealistic one. 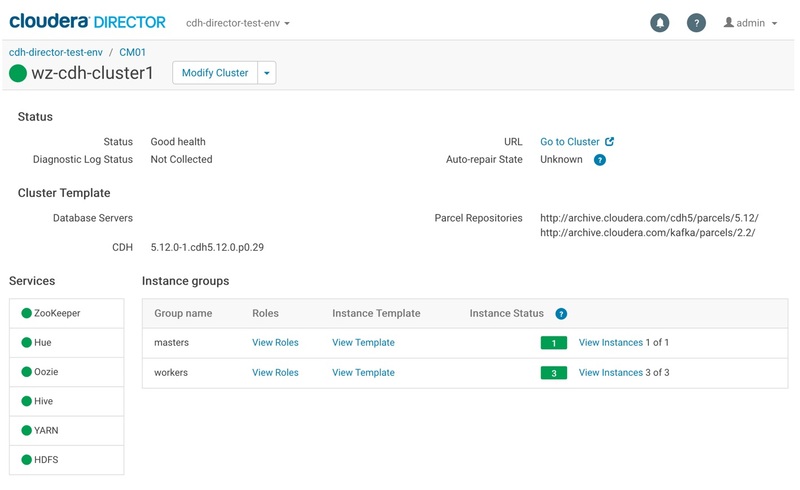 If connect as with master = “yarn-cluster”, the spark driver will be somewhere inside the Spark cluster. For our current case, I don’t believe this is the right solution. Don’t even try it. Someone recommended to run a spark-submit to verify SparkPi can be run from the environment. This looks reasonable. The good thing I figured out the issue before executing this one. But this definitely a valid and good test to verify spark-submit. There is an interesting post Add support for `yarn-cluster` with high availability #905 discussing about the issue might relate to multiple resource managers. We use HA and this post is an interesting one. But might not fit into our case because I feel we have not reached to the HA part yet with Class Not Found message. Verified it and we have it. So this is not the issue. After reviewing or trying out some of above solutions, I like to go back my way of thinking. I must say I am not an expert in R or RStudio with very limited knowledge about how it works. But I did have extensive background in Spark tuning and trouble shooting. I know the error message Gateway in port (8880) did not respond is always the first message shows up and looks like the cause of the issue. But I thought differently. I believe the 2nd error NoClassDefFoundError: org/apache/hadoop/fs/FSDataInputStream looks more suspicious than the first one. Early this year I helped one of another clients on a weird Spark job issue, which is in the end, was caused by the incorrect path. It seems to me the path might not be right and cause Spark issue, then caused the first error of port not respond. With this idea in mind, I focused more the path verification. Run the command Sys.getenv() to get the environment as follows. 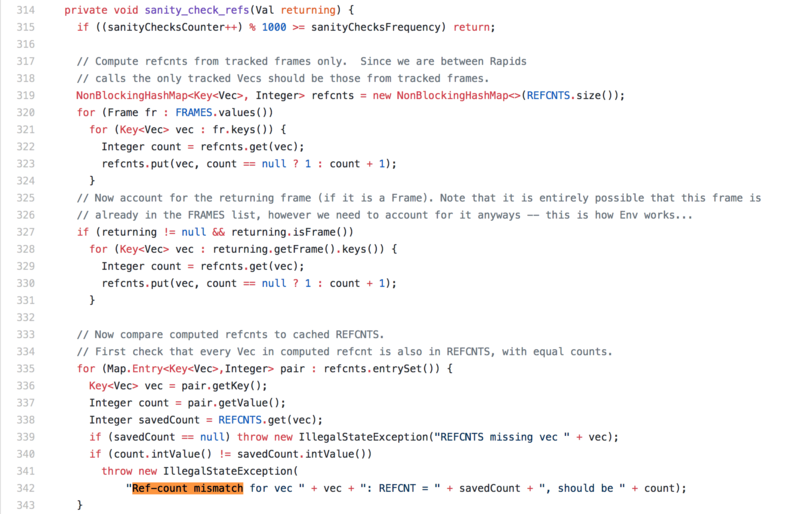 Ahhh, I noticed the environment missed SPARK_DIST_CLASSPATH environment variable. Then I set it using the command below just before sc <- spark_connect. Ok, try it again. Fantastic, it works! Ok, here is the real cause of the issue. It’s unnecessary to specify java path for sparklyr as it does not require a java path. However, it does have dependency on spark-submit. When spark-submit is executed, it can read java path and then submit the jar files to Spark accordingly. The cause of the issue if SPARK_DIST_CLASSPATH is not set, spark-submit is not working and Spark executors can not be launched. 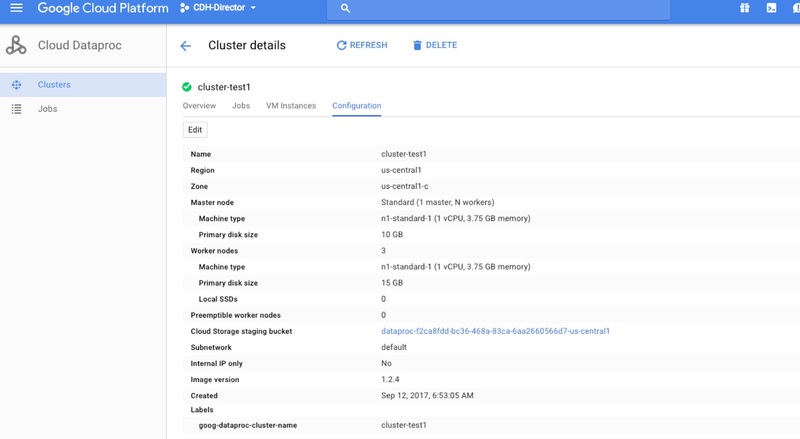 There are many ways to create Hadoop clusters and I am going to show a few ways on Google Cloud Platform (GCP). 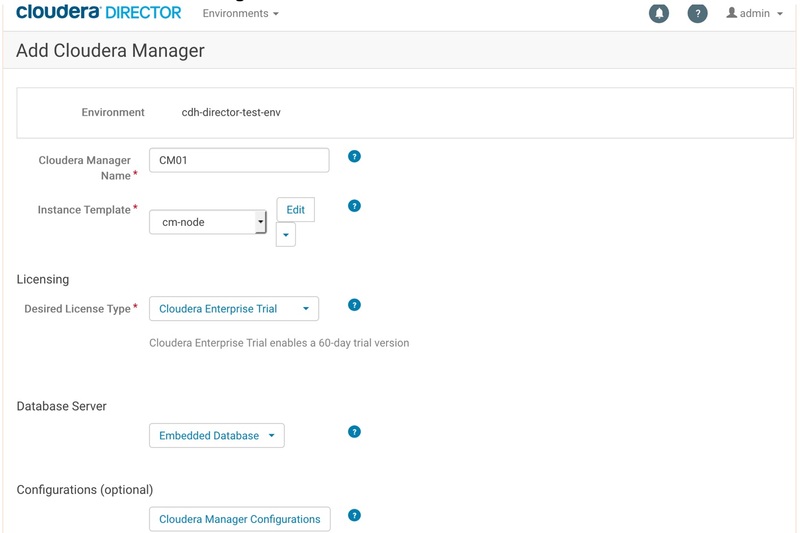 The first approach is the standard way to build a Hadoop cluster, no matter whether you do it on cloud or on-premise. 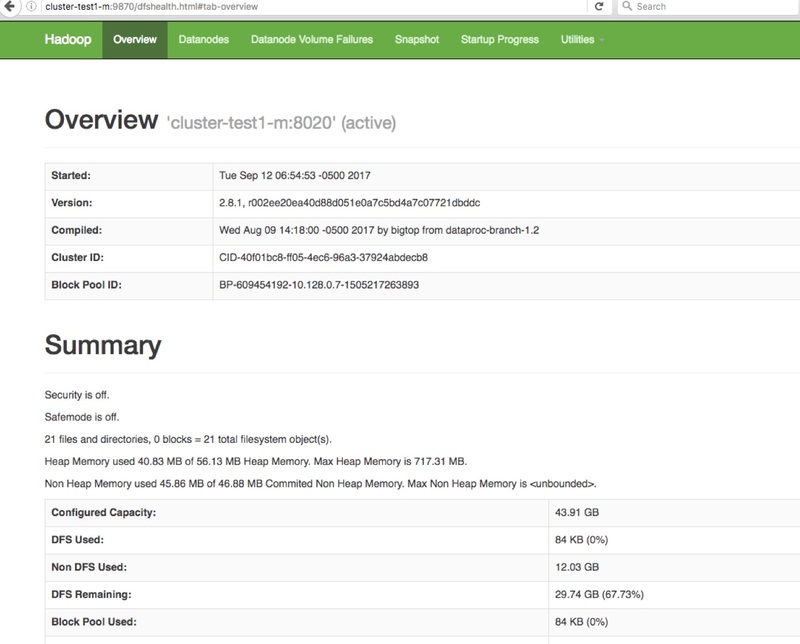 Basically create a group of VM instances and manually install Hadoop cluster on these VM instances. Many people have blogs or articles about this approach and I am not going to repeat the steps here. within 2 minutes. 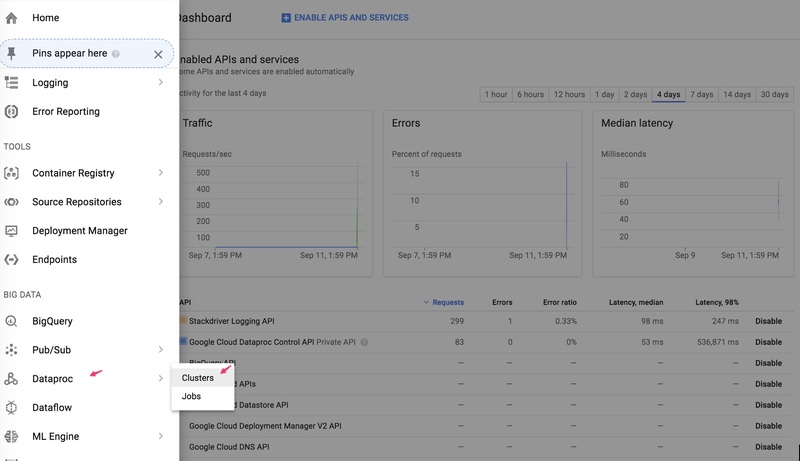 Google Cloud Dataproc is a fully-managed cloud service for running Apache Hadoop cluster in a simple and fast way. 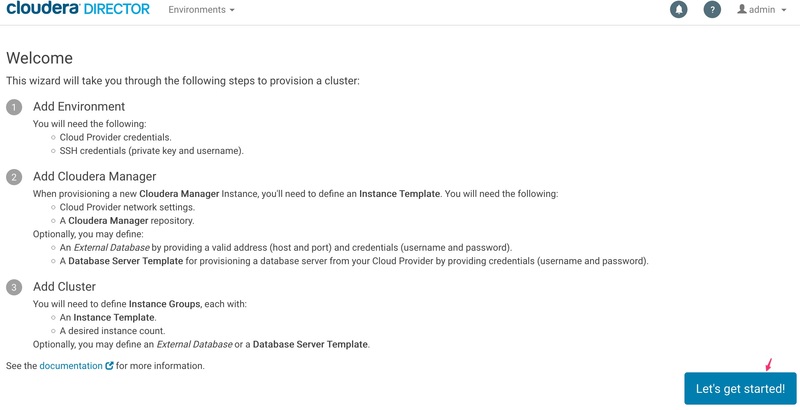 The followings show the steps to create a Hadoop Cluster and submit a spark job to the cluster. Machine Type : The default is n1-standard-4, but I choose n1-standard-1 just for simple testing purpose. Cluster Mode : There are 3 modes here. Single Mode (1 master, 0 worker), Standard Mode (1 master, N worker), and High Mode (3 masters, N workers). Choose Standard Mode. Primary disk size : For my testing, 10GB 1s enough. Similar configuration like Worker node. I use 3 worker nodes and disk size is 15 GB. You might notice that there is option to use local SSD storage. You can attach up to 8 local SSD devices to the VM instance. Each disk is 375 GB in size and you can not specify 10GB disk size here. The local SSDs are physically attached to the host server and offer higher performance and lower latency storage than Google’s persistent disk storage. The local SSDs is used for temporary data like shuffling data in MapReduce. The data on the local SSD storage is not persistent. For more information, please visit https://cloud.google.com/compute/docs/disks/local-ssd. 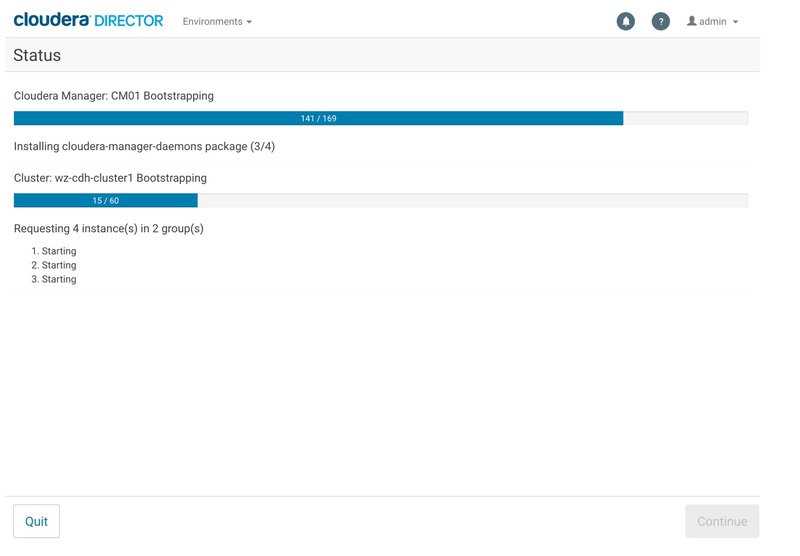 Another thing to mention is that Dataproc uses Cloud Storage bucket instead of HDFS for the Hadoop cluster. Although the hadoop command is still working and you won’t feel anything different, the underline storage is different. In my opinion, it is actually better because Google Cloud Storage bucket definitely has much better reliability and scalability than HDFS. Click Create when everything is done. After a few minutes, the cluster is created. Click cluster-test1 and it should show the cluster information. 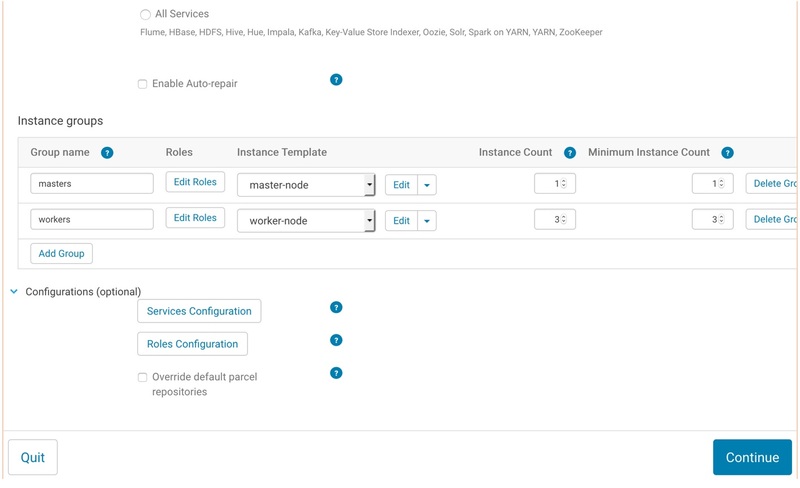 If click VM Instances tab, we can see there is one master and 3 worker instances. 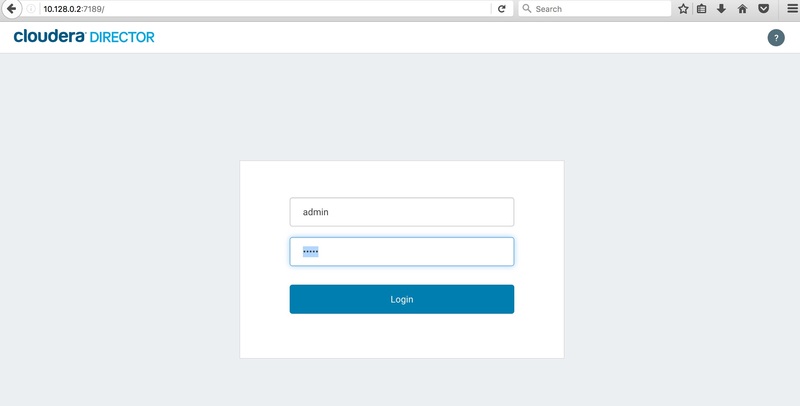 Click Configuration tab. 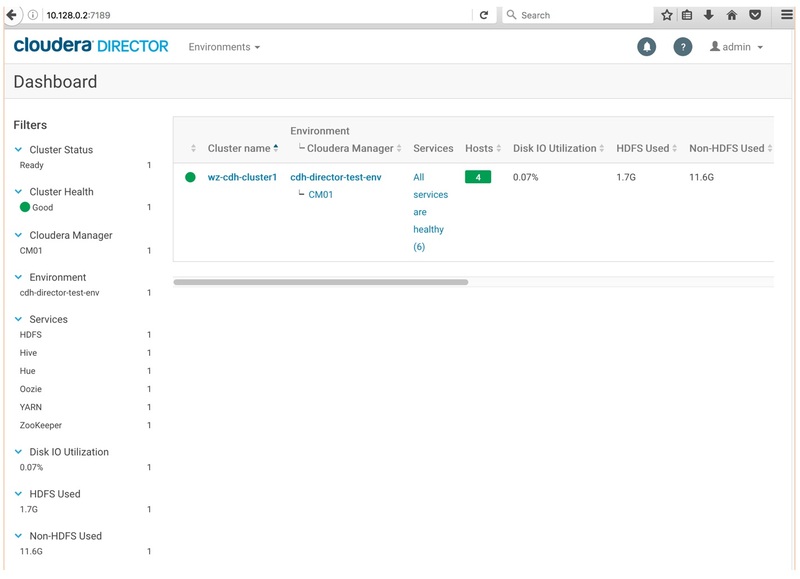 It shows all configuration information. 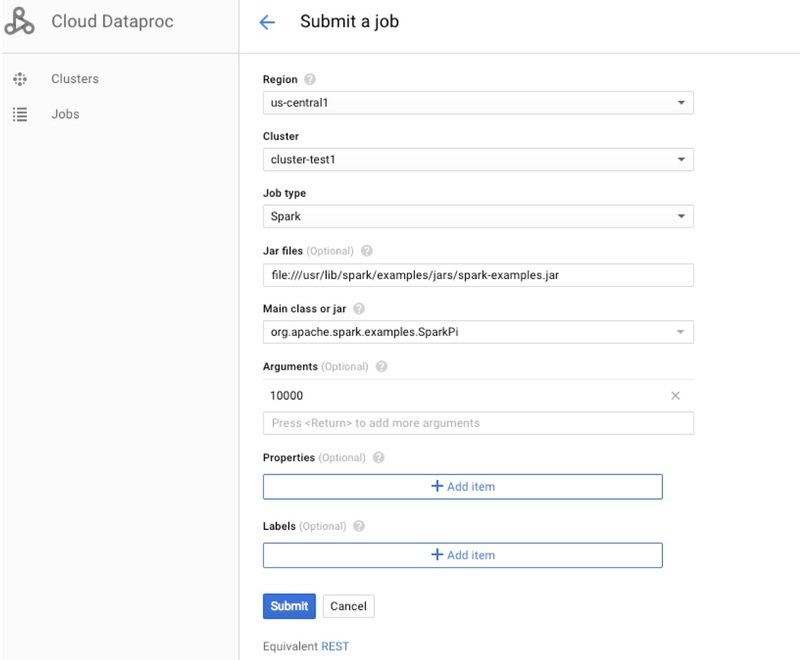 Click Cloud Dataproc -> Jobs. Once Submit Job screen shows up, input the following information, then click Submit. To verify the result, I need to ssh to the master node to find out which ports are listening for connections. 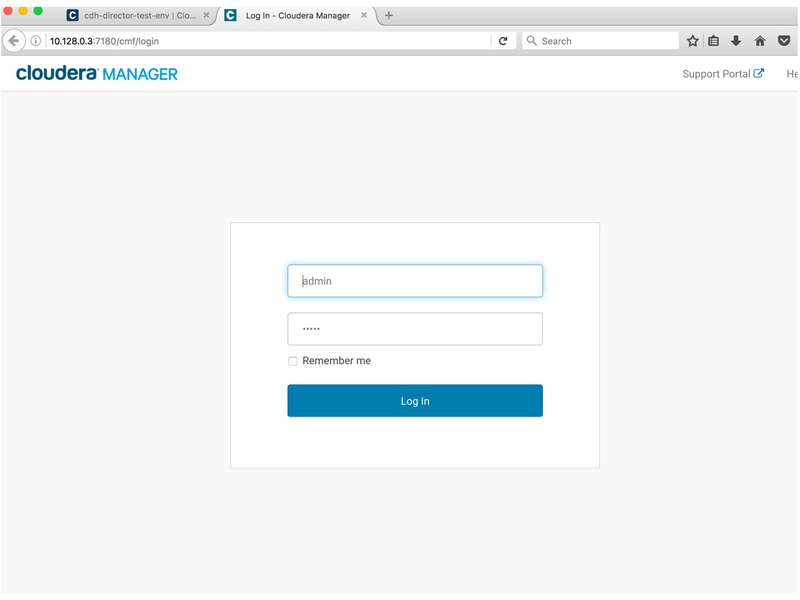 Click the drop down on the right of SSH of master node, then click Open in browser window. Then run the netstat command. There are a few UI screens available to check out the Hadoop cluster and job status. 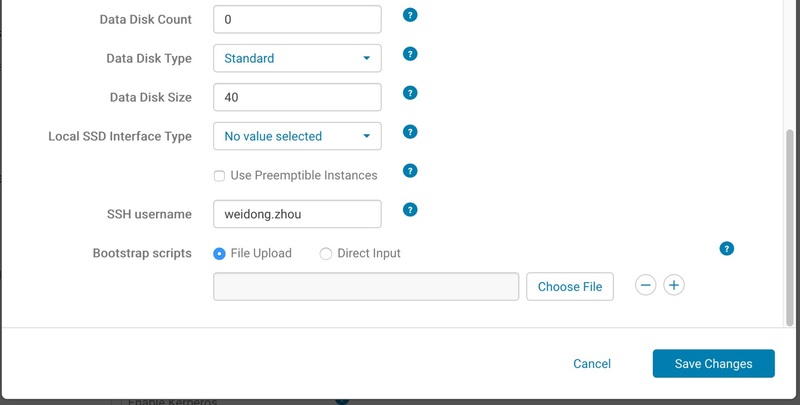 Dataproc approach is an easy deployment tool to create a Hadoop cluster. 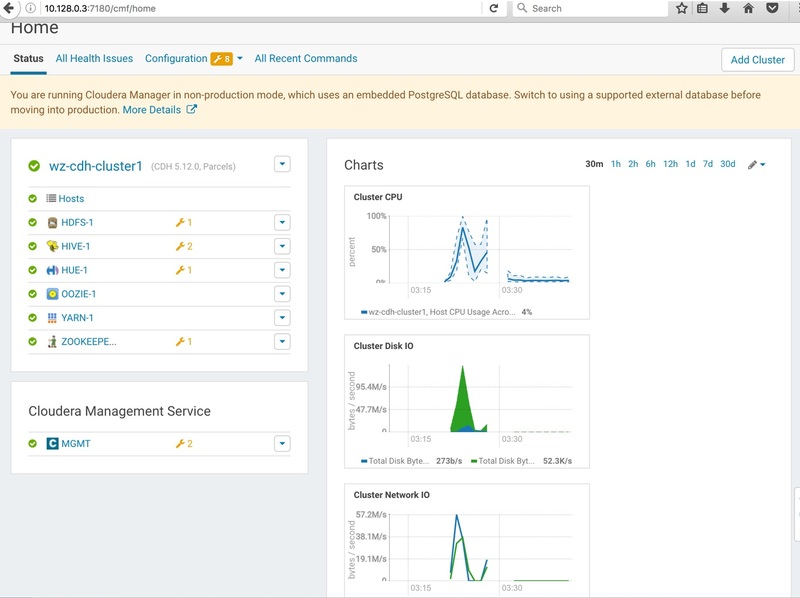 Although it is powerful, I miss the nice UI like Cloudera Manager. 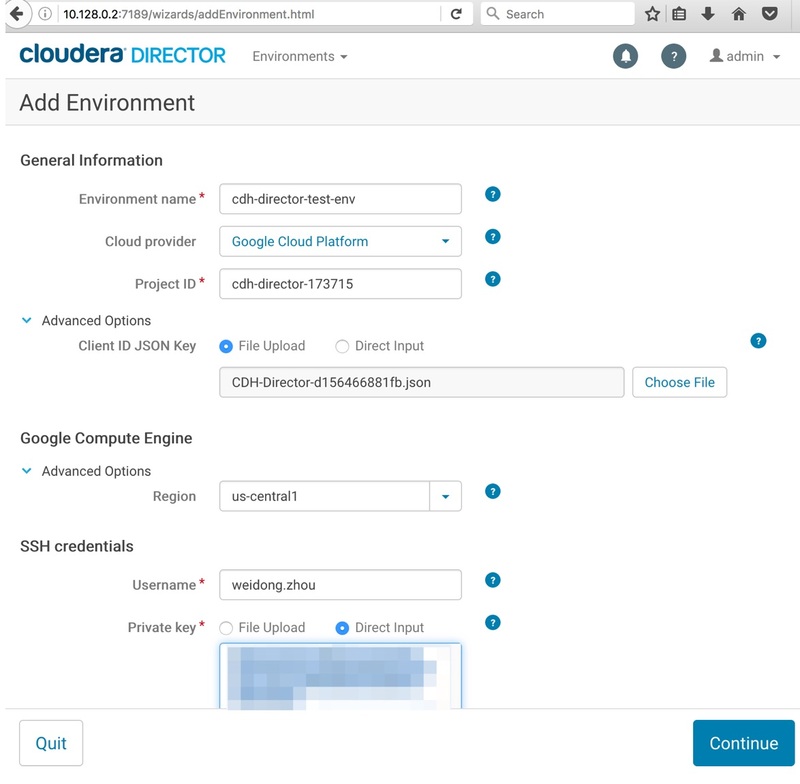 To install Cloudera CDH cluster, I need to use a different approach and I am going to discuss it in the future blog.